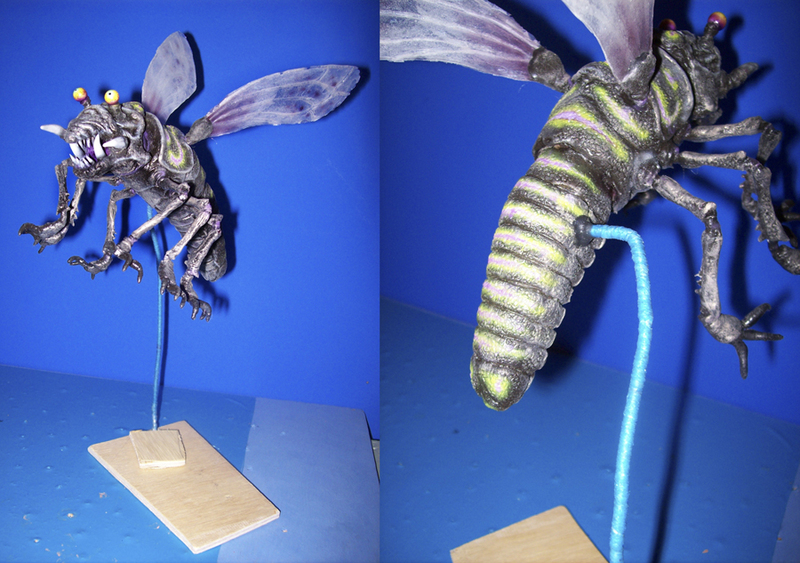 In order to animate the beast flying around with as little trouble as possible I attached a thick aluminum wire rod to the puppet. The rod was covered in soft string and painted blue, and stuck to the side of the puppet that isn’t going to face the camera as planned. If I were to change that set-up I’ll just flip the image in the editing and that should work out fine. I prefer to use a support rod to hanging the puppet from strings attached to an aerial brace, which can be a bit of a mess. You also have to stop the puppet from swinging every time you’ve touched it. When the puppet is attached to a rod it stays put. Sometimes you have to remove the rod in post prod editing, but it’s worth the trouble.